After getting back from my 10 day Vipassana course (I haven’t put up the blog post on that experience yet, but it’s coming), I started thinking a lot about the nature of love, and unconditional love in particular. I’ve been in a number of romantic relationships in my life, and as evidenced by the fact I’m currently single, none of them have been ‘successful’ in the conventional sense. It’s now that I realize that I didn’t know how to love, and am just beginning to teach myself. I surmise it’s because as an adult I mimic a variety of love I observed as a child and young adult. While I’m certain my parents loved me and still love me unconditionally, a lot of the love displayed was conditional. As in many South Asian families, my parents demanded excellence of my siblings and I in the things that mattered to them. Those things were primarily academic accomplishment and victory in Sunday School speech and essay competitions. These external achievements were met with praise, while results short of their standards were met with disappointment. When my dad saw a quiz or a test with a “98/100” at the top, he usually asked after the remaining two points. Additionally, my parents were very conscious of how we were perceived in our tiny Muslim and Pakistani communities, which were small and insular in the tiny villages and small towns of our youth. Sometimes they would prioritize how others might perceive us over our happiness and family harmony. That type of externally-oriented self-consciousness has consequences. I discovered a YouTube video on Reddit on procrastination (the irony is rich in this one) by a Canadian psychology professor who’s an expert on the topic. His colleague Gordon Flett discovered a high correlation between procrastination and being a “Socially-Prescribed Perfectionist” – meaning that you’re more likely to procrastinate if your performance and achievement is motivated by the opinions and judgment of other people. 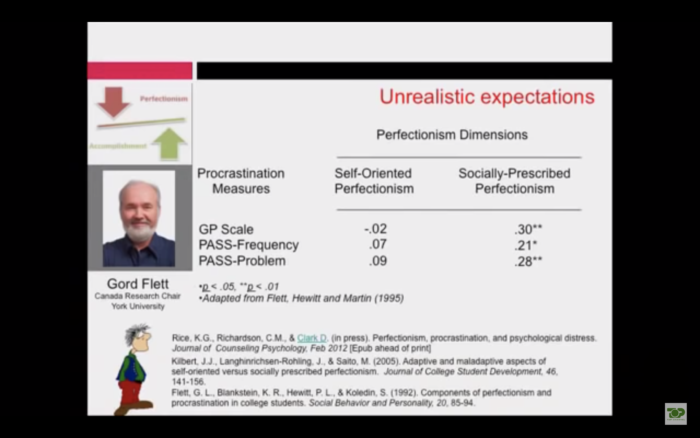 In contrast, he discovered no statistically significant correlation between “Self-Oriented Perfectionist” behavior and procrastination. This feels very true to me from my experience as a severe procrastinator. Now, I think modern adults ascribe too much fault to their parents’ child-rearing for their own problems. Especially if you were raised in an immigrant household in the West, your parents’ efforts are the very reason you’re educated enough and capable of actualizing yourself to the point of understanding psychological theories that emphasize childhood conditioning as major factors in personality development. But there is something to that line of thought – it’s no accident two of the greatest paradigm-busting entrepreneurs of our time, Steve Jobs and Jeff Bezos, were given up for adoption by their fathers. There’s a great New Yorker cartoon (which I can’t find despite looking everywhere) in which a twenty-something sits despondent at the kitchen table while her parents look on perplexed. But coming back to my original point, I think young people growing up in these environments can grow up to be adults who don’t know how to love unconditionally, and perpetuate into their new adult relationships the pattern of critical behavior they faced as children. I know I did that and probably still do. In addition to the procrastination and unconscious display of overwhelmingly conditional love in relationships, I’ve also done things I reasonably thought were motivated by love at the moment, but in retrospect were also in large part motivated by other feelings such as guilt, expectation and responsibility. I can’t tell you how many times I’ve watched this video. Such an important lesson to put into practice in daily life. So I guess my message is this: be conscious of the love you show to people you care about, and make sure it’s the type of love you mean to give. © 2019 Home • Slightly Theme by Nick Ciliak.